If only I’d remembered to take my benadryl last night, I would have slept great, ’cause Dan turned off the AC! As it was, I woke up at 6:30, wide awake, but because the room was so nice and quiet I was able to go back to semi-sleep till after 8am! Last week I got a book called “No Need to Knead” from the library and it taught me how to make fantastic Italian-style bread. You really and truly don’t need to knead if you make a nice wet dough and let it sit around for a while. And the bread has a fantastic texture, light and chewy with a perfect crumb and crust. Take a cup and a half of warm water. Whisk in a package of yeast. Stir in almost three cups of flour and a teaspoon of salt. This will make a very sticky wet dough that will just barely want to creep away from the edges of the bowl and almost form a ball. It’s completely un-kneadable, so don’t even try. You don’t have to! Now, cover the bowl with a plate and refrigerate overnight or leave it alone for an hour or two on the counter. With the fridge method, take the dough out in the morning and let it come to room temperature. Smack the dough with the back of a spoon till it deflates somewhat, then let it rise again. After the dough has again risen in its bowl for a while, pre-heat the oven to 500F and then pour the dough into some kind of pan (I use my smaller cast-iron skillet, greased). You don’t have to worry about forming the dough in any particular way, just glop it gently into your pan and pop it into the oven. Turn the oven down to 450F and bake until the bread smells heavenly. Sorry, I don’t know how long, maybe half an hour or so. But check it when it starts to smell really good. The crust should be golden brown. Take it out of the oven, turn it out of the pan, and let it cool before cutting. Don’t give in to temptation! You really do need to wait or it’ll be a gummy mess. I prefer the rise-on-the-counter method. I mix up the dough in the morning and bake it in the early afternoon. The fridge method lets the yeast develop a bit more of a tangy flavor. Try it both ways and see which you prefer! I have baked a lot of bread in my life, but never never never have I made anything this good with so little work. It’s just as good as the fancy Italian bread from Trader Joe’s! You can learn lots more variations and techniques from the book, so run out and beg/borrow/buy a copy right now! At last, photos of my birthday presents! Second: I had a fantastic birthday! I hope, later today, to get all of my loot into a pile and take a photo to post. The textures! The colorwork! The interesting and inspirational designs! I’m in love with the Tilted Duster on the cover, and it just occured to me that my bright red Brown Sheep worsted (which used to be a BPT cardigan) might be suitable if I can get gauge. It sure would be nice to get gauge and not have to redesign the thing. I’d rather not knit a sweater in bits and sew them up — but this one, sensibly, has the bodice knit in bits and then the skirt knit all in one from the waist down. I think I could juuuuust put up with that. The article on Cables looks interesting. I skimmed it and look forward to reading the whole thing soon. I’m a BIG FAN of cables, as you have probably figured out. The Hedgerow Coat is luscious and is on my make-it-someday list. The simple and elegant Placed Cable Aran would be beautiful with a different neck treatment — an easy modification. The Minimalist Cardigan — another make-it-someday project. Love the texture, love the shape. Nomad Hat and Scarf: Cute and strange and interesting. Cinnibar Pullover — yum! Not one I’d probably make, but still, yum! Luna Dress and Little Red Dress — both need better necks and sleeves (ewww! ), but great for inspiration. Cobblestone Pullover — another yum! Simple but unique and interesting. Toe-up staff socks — lots of inspiration to be had there. Better photos would be nice. And even the patterns which I don’t find so appealing are far from yuck, unlike the last issue. Hooray for Interweave Knits and their new editor, Eunny Jang! spotted this nice ultra-plain theme today… still fiddling, bear with me. Problem: I can’t remember how I fixed my old theme to suit me, especially the sidebar. I remember that it was a TON of work. Also, I can’t remember how my old theme looks without turning it on again. So, until I either finish tweaking this theme or give up and go back to the old one, this blog will be bouncing around between themes. Gah. It’s almost not worth it, but I suppose it’s good for my brain. The most recent LibriVox Community Podcast is great! This week’s show is hosted by Sean McGaughey (ductapeguy). The theme of this week’s show is Plumbing or Unsung Heroes: The Librivox Technical Team. Oh, you might also enjoy our New Releases podcast! I sure do! Sweaty Guy creeps me out. No wonder I had anxiety dreams last night. We watched the first two episodes of BSG season 3 last night, so of course I had anxiety dreams all night and woke up too early. Bah. Henry brought a Go set home yesterday and we played a lot today. Fun! Read about it on his blog. Also did a mega-super-grocery shopping together. Um, we did lots of other stuff today but too tired to think so that is all for now. Played music with Dan. Kashmir was too hard, Sunday Bloody Sunday is ok, Free Four is super-fun. I need to practice! With Dan’s help, migrated ALL of our mp3s to my iMac (Strangelove). Am now working on removing duplicates, adding proper tags and album art, fixing genres, etc. Read half of The Sea of Trolls, by Nancy Farmer. Excellent kids’ historical fiction, takes place in the 8th century! Song: “Oh lately it’s so quiet”. Here’s an adorable fan-made video. I love the hand-clap/guitar bit for the solo, and the creeping girl! Here’s a live version of the same song! <3 <3 <3!!! Thanks, OK GO, for not suing people for posting (and making) videos! You rock! 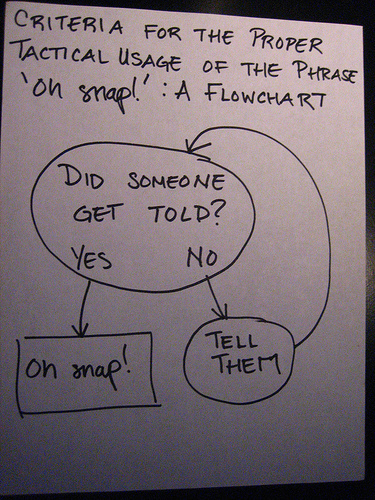 Oh, how I love pop culture flow charts! On Thursday night, Mom and I went to see Hamlet at the Old Globe Theatre in Balboa park. It was just wonderful! I thought Polonius was especially good; his timing was exquisite, and, while he was rather muddled he never seemed stupid. Um, I could go on and on but you might as well just read this glowing review. And I do agree with the review about Ophelia’s “two gestures that reduce the mystery of her madness”. Those gestures (heck, no one who reads this is going to mind spoilers — she cradles her obviously pregnant belly in the Mad Scene) felt false and unnecessary to me. But really, that was the only part of the entire show that bothered me. It was a magical performance.